Pain. How we fight it! We are willing to make adjustments, to settle and even to quell the voice of our conscience to avoid pain. If only we’d let it in, realizing that darkness is a necessary part of finding the light. Imagine pain to be a dark tunnel you have to travel through to get on with your life – to reach your dreams. There’s always light at the end of the tunnel, but we can’t see it. We have to make that journey to find the light. 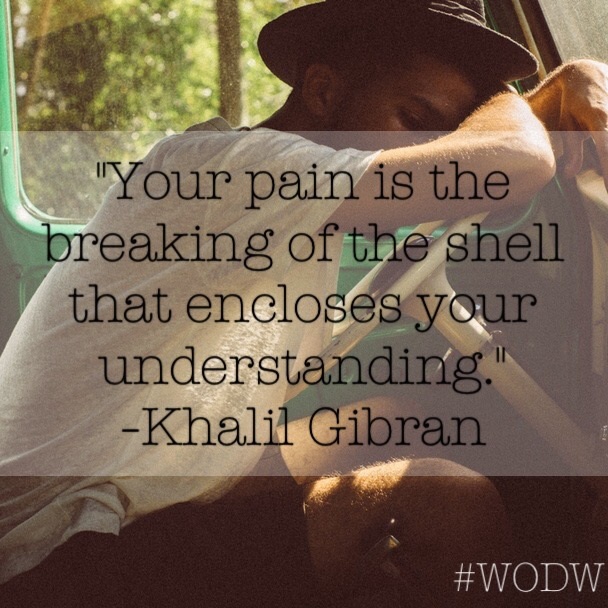 It’s only when we allow pain in that we can understand our own journey and destination in life. Pain allows us to look into the dark places of our being and allow the light of grace into them. Only when we acknowledge that we are hurting can we allow ourselves to be healed. Agghhh…the anecdote at the beginning put a lump in my throat! Thank you for sharing that. Youor words seriously have me reflecting on how tightly I hold on o being comfortable. I think that is a source of unhappiness for sure! Like, I’d rather stay mum about certain things as to not bring myself pain; but that in and of itself is a pretty painful reality too. Thanks so much, Mia! I loved the prompt and I’m always happy to participate in #WODW. “darkness is a necessary part of finding the light.” great reminder and a wonderful post. I’m glad this spoke to you, Esha. Wishing you grace through your pain. Hugs!